Pro-Am Team Sports opened its doors in January 2014, and moved into our location in Mokena, IL in October of that year. 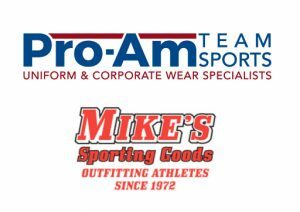 In October 2015, we acquired Mike’s Sporting Goods, also a team uniform dealer based in northwest Indiana, with retail locations in Schererville and Crown Point. During 2017 we are bringing the businesses under one company name: Pro-Am Team Sports. We are keeping our locations in Illinois and Indiana. The merger increases our capacity in on-site screen printing, heat transfer and embroidery, and adds a direct-to-garment printer. This gives us the ability to serve our customer better. We can offer more quality products at competitive prices to meet your deadlines. We work with High School & College Teams, Community Organizations, Non-Profits, Businesses and Many More.